Welcome to the 274th Tablescape Thursday! Thanks sooo much for all the comments yesterday helping me decide which garden seat I should use beside the blue and white check chair in the guest room. I had planned to return the bluebird seat if I didn’t use it in that room but you definitely convinced me to go ahead and keep it no matter if I use it in that room or not. If you get a chance, be sure and read the comments on yesterday’s post. So much great information about how we all approach design and how we evaluate a space. I wanted so badly to join in and leave a comment thanking you for your insights or to say, “Yes, I was thinking the same thing” but I didn’t want to say anything to influence you in any way, really wanted to hear your thoughts. I need to go through and add up all the yays and nays. I think it’s going to be a close one! I’m back this week for Tablescape Thursday with another table inspired by the now famous, Better Homes and Garden, Walmart Dishes. 🙂 I love a themed table, even when the theme is subtle and not overly obvious. Looking at the centerpiece, if you have some of this dishware, which salad plate pattern do you think inspired this table? I used antler-handle flatware along with cinnamon-color flatware for this setting. Love how they look together and work with the colors in the place setting. I’m up to my old tricks again, using a tree ornament as a place card holder. Have you guessed which salad plate I’m using in this week’s table setting? This place card holder is a big hint! This pattern was one of my favorites in the B H & G dishware. There’s even a little tree tucked into our open sleigh. I also used an ornament for the napkin rings. 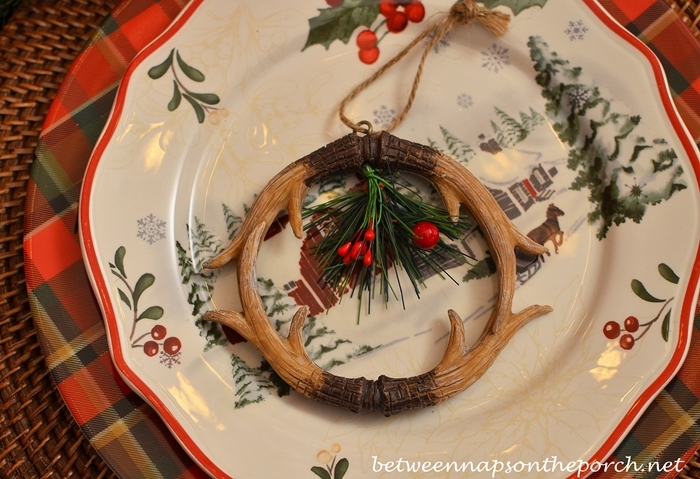 This little antler ornament works well with the antler handles on the flatware and with the centerpiece. If you use these in a table setting as napkin rings, you can leave the little metal hanging loop and hanging cord in place (as I did) and it becomes a gift for your guests to take home at the end of the night, something to remind them of that wonderful evening for years to come. Glittery, gold stars dot the greenery surrounding the centerpiece. This setting would be beautiful with some lit votives to set off the sparkle of the little stars. Love both of your table settings !The little sleigh ornaments are adorable !I used the same Walmart plates in my table setting 🙂 Love them ! 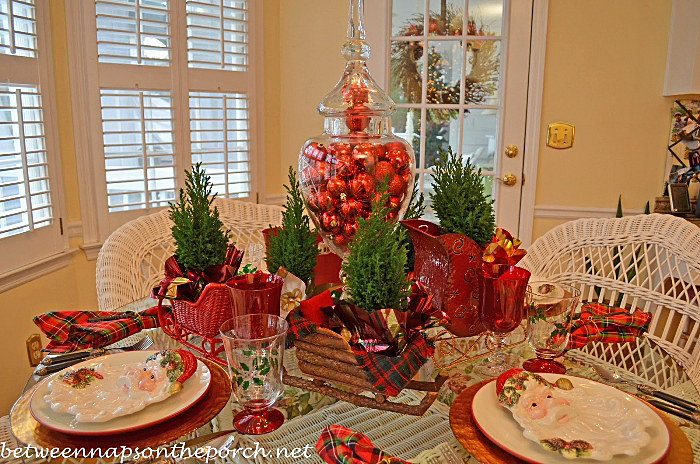 I love your table Susan with your creative use of ornaments as place card holders & napkin rings! I think you’re responsible for Walmart selling out of the BH&G salad plates in record time! Thanks so much for sharing your sources and the inspiration! What adorable plates! Lovely table as always Susan…thanks for hosting! Susan…your tablescapes for the holidays are always such a beautiful inspiration to us all…I so love the Wal-Mart BH&G plates…so nostalgic and reminds me of Currier and Ives….thanks for hosting and presenting us with this gorgeous table today!! Shirley, I hadn’t thought about that, but you’re right! Really does make you think of Currier and Ives. 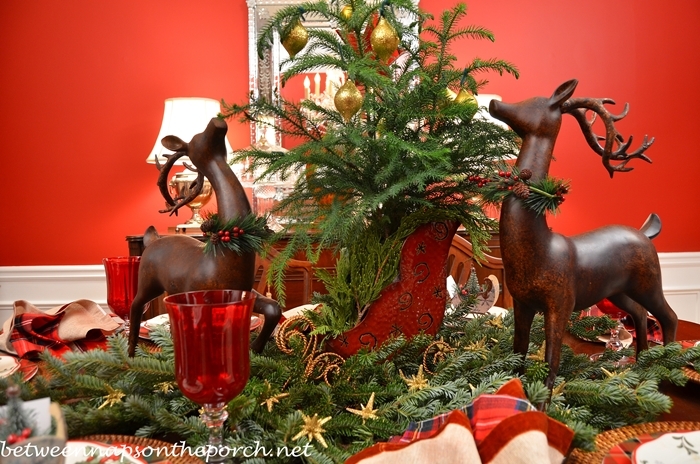 Susan – I love everything about this table, but I am crazy about your re-purposing of the Christmas tree ornaments. I think that is brilliant! I definitely will steal this idea (not illegal, if I warn you, right???). I know your house looks fantastic and hope that you and your family have a fabulous and merry Christmas! Diane, please steal away! 🙂 I found those in Walmart this year. They tend to sell out quickly but there may still be some left. Merry Christmas to you and your family! Beautiful tablescape, Susan! I can hear the sleigh bells jingling. You really captured the holiday mood! I remember those posts with the deer in them! The tall sleigh is a perfect holder for the Norfolk Island pine! Those are sweet dishes- do they still sell them? I adore those little sleighs- those are keepers! I see what inspired you to use them 🙂 Thank you as always for hosting the Tablescape Thursday party! Thanks, Liz! ♥ Some Walmarts may still have the dishes, it’s probably hit or miss. I’ve gotten some comments in the last day or two from folks saying they found some, so you may still find them in some locations. Gorgeous Susan! 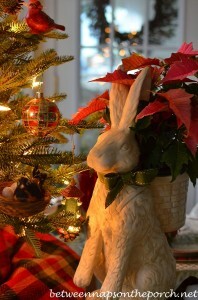 The pride in the deer as they strut around your centerpiece in the star studded greenery is just joyful! the sleighs with the bottle brush trees are SO CUTE! Thanks for sharing another incredible table! Another gorgeous table. Love dashing through the snow with the cute sleighs and of course those wonderful plates. Those plates make me happy everyday!! You make such exciting tables- I look forward to your blog. I adore all your tables but still number one for me is the one you did with your houses. That one was over the top ! Thanks so much, Peggy! I think that table is still my favorite, too. It was so much fun to create and I got to be 10 years old again! 🙂 These plates really do make you smile, don’t they. The scenes are just so heartwarming and beautiful. Susan, I love these plates, too. 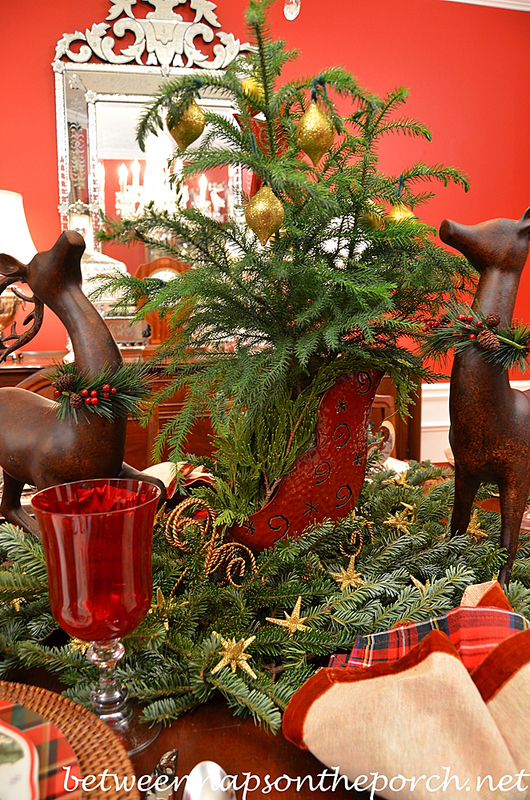 Your sleigh centerpiece is perfect with them! I love how your deer are versatile enough to use in other settings besides Christmas. I noticed you chose to leave off a table cloth. The rich wood looks really nice with the natural elements on the table. Thank you for hosting each week! Susan, I love this tablescape. Those antler ornaments are the cutest thing. Where did you find those? You have probably had them awhile. Your table gives me such a nostalgic feel! I just bought those plates too, I had to buy the set because I couldn’t find any of the salad plates around me. Thanks for sharing your beautiful tables, so much inspiration! I’m glad you got the set, folks are telling me it’s sold out now. 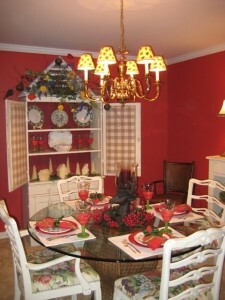 Gorgeous table….I have always loved and had a serious crush on your Dining Room, but never more then the Holidays…. Your table is so pretty..Thanks for hosting this party. There are so many beautiful blogs to visit this week.. Such a beautiful table , and so creative. I always wait eagerly every week to see what whimsical item you have used in your tablescapes, but I think antlers is the best yet! Thanks for hosting. Just BEAUTIFUL, Susan! I’m impressed with how many DIFFERENT looks you achieve with many of the same elements used before. The little trees in the sleighs are precious! I almost bought those salad dishes yesterday, but several of the ones at my store were chipped & I was afraid that would happen to any that I might bring home. DH isn’t the most careful person in the world when it comes to emptying the dishwasher! I guess I shouldn’t complain. Thank you for hosting TT again…I was glad I had a few items that qualified for the subject. I won’t do my *official* Christmas table till next week …I hope! Crazy~Busy Season!! Thanks, Rett! Wow, they must have been really rough with them in the store because they feel so durable. I haven’t had any problems so far with mine. At $3 each, I won’t be upset if one gets broken but they don’t feel like they will break easily. The other BH & G plates I’ve purchased from Wally World over the last few years have held up well, too. Gayle, if it’s a really tall centerpiece, I just move the tall part to the sideboard to enjoy during the meal. I love a tall centerpiece! I’ve also read that in books about entertaining and table setting…to just move tall centerpieces to the sideboard. 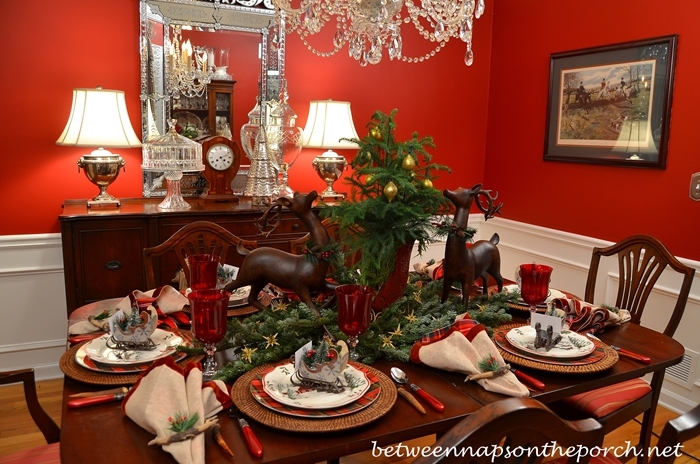 Click on the link I have above in this post for the dinner party I hosted last Christmas and you can see how the deer looked in that setting. They were short enough, they weren’t any problem. If I were dining at this table, I’d move the sleigh with the tree to the sideboard as every sit down. I think guests love to see a beautiful table when they first arrive so don’t limit yourself on the centerpiece…just do what you love and move it to the sideboard or to the kitchen when folks sit down for dinner. Hope that helps. Thanks! Linda, I hope you can find some. I’m still getting emails each day from folks who just found them so apparently some stores still have them. Love, love, love this dining roomThis is just such a beautiful table! 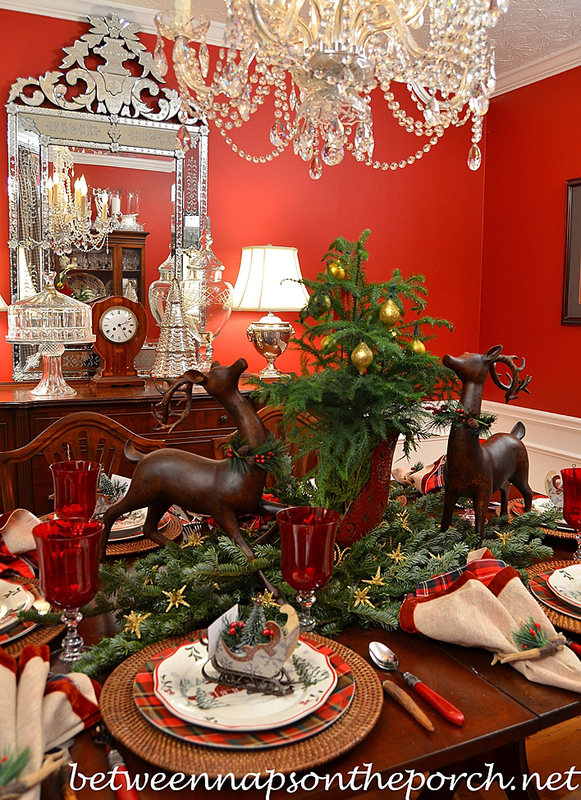 It is elegant, warm, Christmasy, a bit of whimsy, everything is one gorgeous setting! I so enjoy seeing all you can do with your different tablescapes. This is one of my very favorites–until the next one!!!! Beautiful! Everything looks so festive and I love giving the napkins rings as gifts to your guest to remember this special dinner. 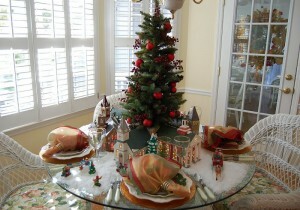 Susan, I love your table and the ornaments as placecard holders are fabulous. You make dining fun and I love your blog all the time but especially at Christmas time! Very festive, Susan, love the sleighs! I used my WS tartan plates too, got them at the outlet last year very cheap! I am waiting for the tablecloth to be marked down. Today they have 50 off all holiday. Off to check it out. Thanks, Pinky! They came from Walmart’s ornament department…both he sleigh and the antlers. What great ideas…so lovely! 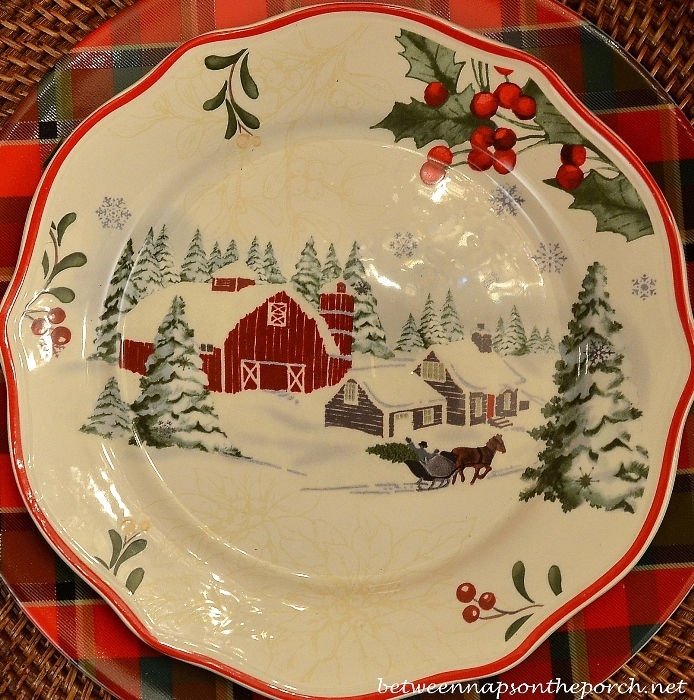 I need MORE Christmas plates like I need a hole in the head…but…those with the sleigh…..sigh…. It is my mission to take advantage of after Christmas sales and get some reindeer. I love these on your table and I totally agree about moving the centerpiece when it’s time to sit for dinner. Your choice of flatware works perfectly as well as the napkin ring/ornament. Merry Christmas!! Sandra, check Cracker Barrel if you have one in your area. I don’t know if they have them this year, but in past years they’ve had some beautiful deer…I came close to buying more and barely resisted. They usually put their holiday stuff on sale well before the holiday is over. I think I may make a run by the one near me today to just see if things are on sale and what they have. Also, check HomeGoods, TJMax and Marshalls…hope you find some! Thanks, Debbie! If I see some when I’m out and about, I will let you know! Susan, your tablescape is just perfection with the way you blended all of the elements of it. 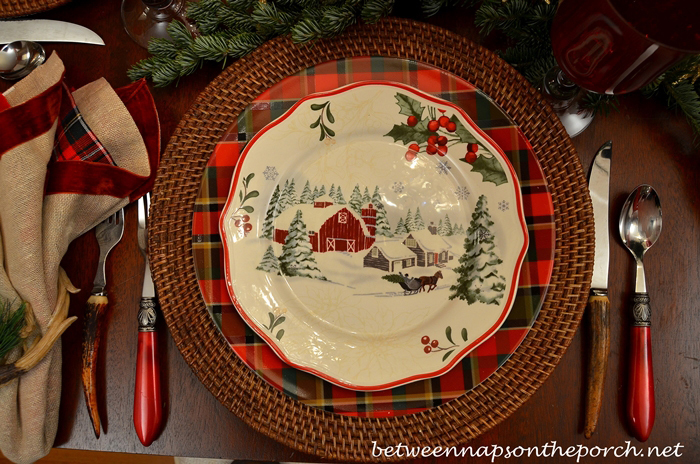 The sled accents on the plates are my favorite…enjoy your Holiday entertaining and thanks for hosting! And merry Christmas to you dear Susan!! Lovely tables!!! Love how you used the sleigh ornies!!! Everything is so festive and you make it all so much fun!!! Thank you for that!! Love this tablescape! Must find some plaid dinner plates. It’s funny that you your sleigh ornaments/place cards came from Wal-Mart this year. Just yesterday I checked our local Wal-Mart for ornaments and they did not get these adorable sleighs; would definitely have honed in on them. This year, I’ll have to settle for the BHG salad plates & platter and several newly added reindeer. Susan, if your Wal-Mart has any more sleigh ornaments, do you ship? 😉 Just kidding but you seem to have a really good Wal-Mart; and you’d expect all of them to get the same inventory. Hope you are having a wonderful Christmas holiday & enjoying all of the favorite things you love to do. Thank you for sharing all that you do with us! lol I doubt there are any left…too bad they don’t sell them online…or do they. I’ve never looked online to see if they have their ornaments there. The Walmarts around here vary a lot too. One near me doesn’t get very many dishes at all, but the super Walmart in this area got a lot more. If you have one of those near you, those are usually better stocked, I guess because they are bigger. They bring things back so if you don’t find what you want this year, Paula, look in November next year because they brought the little antler ornaments I used a few weeks ago back again this year. Love, Love, Love this tablescape! Especially the sleigh-ornament place cardholders!! But I have to tell you ever since you first posted about those dishes I have probably been to 10 Walmarts looking for the salad plate with the bunny rabbit and not one I have been to has had it. I was able to find the others but still pining over the bunny one…..But not giving up!! Merry Christmas, Susan! I am in love with this table setting! For the last 2 weeks shopping Walmart (Mr. P. has been with me), I veer over to those BHG plates. Today he says, “you have so many plates” (which is true, but totally beside the point). They’re almost gone now, but those sleigh ornaments now…! I may just have to make a trip alone. It is gorgeous, Susan! Absolutely gorgeous, and I love how you put high-end, low-end together. First of all your table is gorgeous. I think the plaid is the showpiece. It makes everything look good. btw – the Afternoon Tea was served on Lady Carlyle. Susan, I just love your dishes, it definitely does feel like Currier and Ives. I see in the background, a small tracing of mistletoe, just lovely. The tartan plates are pretty too. Another great tablescape, thank you for hosting. 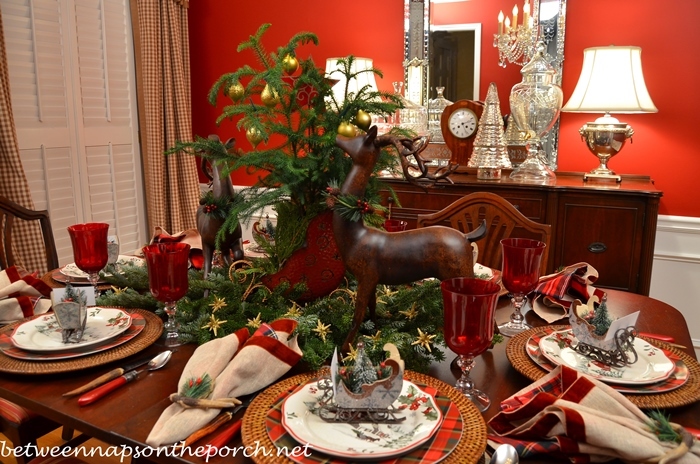 Beautiful tablescape with the gorgeous dishes and the Brown raindeers…really fabulous, elegant an special, Susan! Merry C’mas sweet lady. Thank you for the wonderful holiday party. Beverly, that’s a good point. They would probably be best on the table above the plate. Thanks! So so… LOVE your theme Susan. THough, as I mentioned, am allergic to pines twigs (is that what you call in the US?) I still use some of them. Me & GH just sprayed our meds, LoL* honest to goodness, we both do. Just to make me happy. Have a great day & weekend ahead too. See you next party. I just love this table. Thank you for sharing your talents again this week and for hosting the party! I am going to have to try and find some of those salad plates. I have some dishes from Target from way back that would look great with them. 🙂 I did the same thing allll day yesterday! I have discovered that not all Wal-Marts are created equal. Our local Wal-Mart had very few home decorating items this year. I am in there pretty often and they had very few of the salad plates that went with that set. They did have a really pretty large platter that went with the set though. I have loved seeing all of the different tablescapes using the dishes though. That is def the truth! I discovered that this year, too Suzan. Susan, this is an adorable tablescape. Love the theme! I’ve antler flatware envy! That’s the one things on my Christmas list, but I doubt my Santa even remembers. I think I need to give some more hints. Perhaps I’ll send the link to this scape. Ha! Ha! Love the little sleigh ornaments on those beautiful dishes. Perfection! Thanks, Sarah! I had a hard time finding some I could afford. Good ole eBay came through a few years ago. 🙂 Hope you can find some. 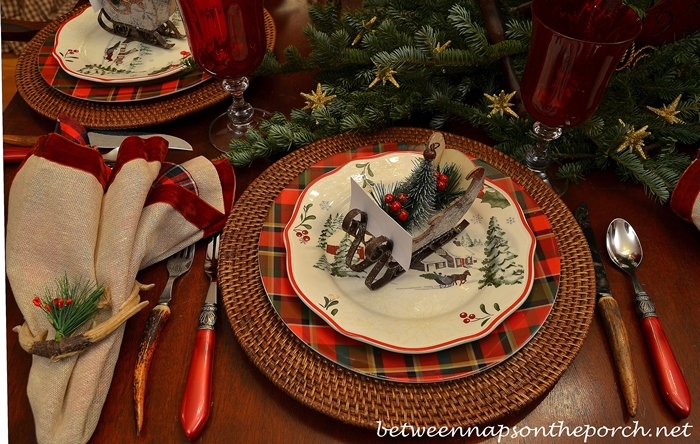 Love this tablescape with the deer, sleigh, antlers plus the pretty dishes. You always give me such wonderful ideas. I love your beautiful tablescape. The salad plates are so pretty ~ I will have to look and see if I can find them here. This is so lush and beautiful, love it! You have a lot of new things I haven’t seen before – the napkin rings and sleigh place cards, etc., really neat! I didn’t see those beautiful salad plates at Walmart 🙁 wish I had! Katherine, some stores seem to still have them so you may still find them. Susan, Sorry to be so late, darn that work thing! I had not given any thought to Currier and Ives being the inspiration for the Walmart plates until now. They are very Currier & Ives with a touch of Norman Rockwell. But here nor there, your tablescape is lovely and as always, very creative. As I have said before, you have conquered the art of knowing when enough is perfect. I really have to study your work more closely to learn your secret of knowing when stop, step back, and say this is just right. I know…that work thing really gets in the way of blogging! 😉 Thanks, Candy! I think some times I add too much but I love a full centerpiece and all the little extras. I FINALLY scored the bird plates today and posted a pic in your links. This is my first time to participate and my pics aren’t great, but I was so happy!!! Whoo, hoo! Glad you found some Debbie! Hi Susan! I’ll be sharing your site with my husband again this week and saying “these are the plates I didn’t buy!” That should make him happy! Susan. I am doing the Happy Dance..I found 3 bunny and 3 deer plates at my Wal-Mart today. I added them with the birds. I was so happy to find. Even had my son in Miami look at several stores there. Could not find a one. Hope to find at least 1 more of the bunny plates. Maybe one of the Columbia stores will get another shipment. Thanks again for showcasing them in your beautiful table setting. You are the best! Yay! That is sooo sweet that your son looked, too. What a great son! I hope you find another bunny plate! They are all so cute! We usually spend the winter with them for about 3 months. Love going to all the store there. We are not lucky enough to have them here in Columbia it’s a big city but not good shopping. Have to to St. Louis even for a Ross store. He’s really good about trying to track down something for me.He went on the hunt for some eyelet edge heart plates,but never found those either. Finally found them on eBay. Which I am sure I will be able to do if I don’t find that bunny plate here.We are in the midst of a really bad storm so no looking for awhile. Hi Susan. You always come up with the best tablescapes ever. Thank you so much for hosting this wonderful event week after week!! I am jumping in and joining, this is so much fun. 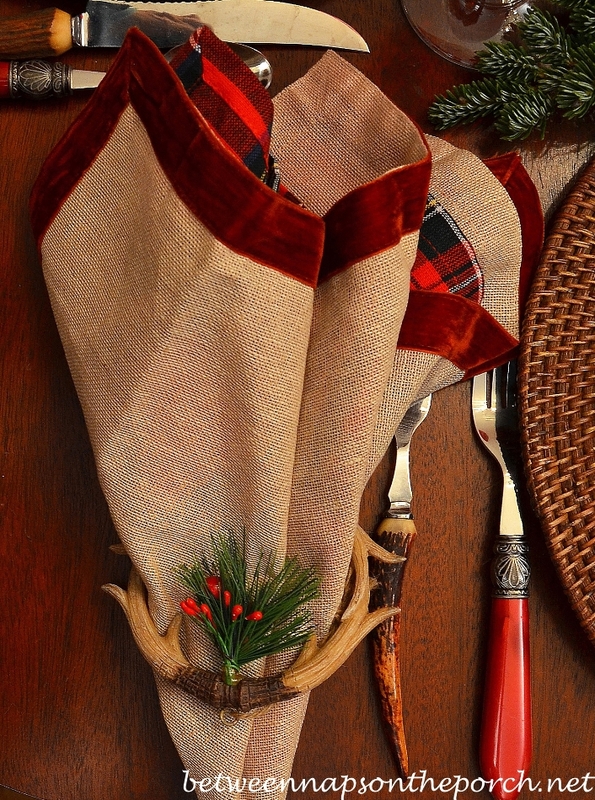 There’s so many thing on your table that I would love to have on my table, but the antler napkin rings are my favorite and I love how you mix 2 napkins, I never though of doing that. Have to try it! Susan, I always enjoy your blog so much, and especially your dining room tablescape. Would also love to see a picture taken of the other side of room, toward your china cabinet sometime. Pat, I think I’m may have some pics showing that from another table setting…let me see if I can find those. Oh what a lovely tablescape, dear friend!!! but I dropped some subtle hints and now I’m waiting for St. Nick!!! 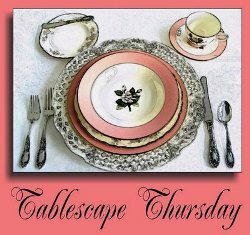 Thanks for hosting each week. . .filled with inspirational tablescaping ideas!!! I’m a little behind in my email so it may be in my Inbox. 🙂 Sure, the red color in my dining room is an older Benjamin Moore color called Raspberry Truffle. I still love it after all this time. I saw it in a beautiful den on a Christmas home tour and had to have it in a room in my home. I don’t remember the color of the white paint now but it was a standard BM color right out of the can, not a custom mix. It was from their Muralo line…not sure if they still have that but if they don’t, I’m sure they have something just like it. BM can probably recommend a great white. In person, in my dining room, it comes across as a bright white, but an off white or cream would be beautiful, too! Susan, I’ve loved your tablescapes and used to be a regular reader, but have been so busy with life that I haven’t had the opportunity to check in on your wonderful blog until tonight…or morning (3 a.m.!!!) while contemplating what to do with my dining table this year. 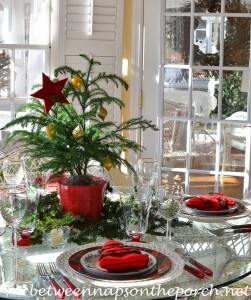 I love your silver, red and white table from last year but your table this year looks similar to what I did last year. Love it! Thanks so much for your reply, Susan. I do the very same thing that you do — have the spread of food along the bar in the kitchen area and allow guests to serve themselves and have the dining room set with place settings, etc. It really took me by surprise when my stepdaughter removed some of the elements of my tablescape that weren’t at all that tall or in the way of our view across the table. I think maybe she wasn’t used to it or her mother removed things from the table and used it for food. Not my way at all. Just wondered what you and others practice was. Thankfully, I’m finding it is very much like my own practice. Thanks again and one other quick question. Do you ever have sales of the pieces or dinnerware sets that you no longer use or want? If so, put me on the list. I’ve been trying to find pieces of the some that I believe I spied on your website some time ago. I’m sure you probably still use it, but if you ever decide to part with any of it, please let me know! I’m in the market for a lot of it — Ma Maison. So far I’ve never sold any because I keep using it all over and over through the years. I don’t think I could ever part with Ma Maison…it’s one of my faves. I keep hoping HomeGoods will get it again one day since it’s been one of the more popular patterns with my readers. Haha! I can relate! I’m sure I wouldn’t want to part with it either, Susan. I keep acquiring and probably need to purge a bit. But it’s hard to do when you love them all! 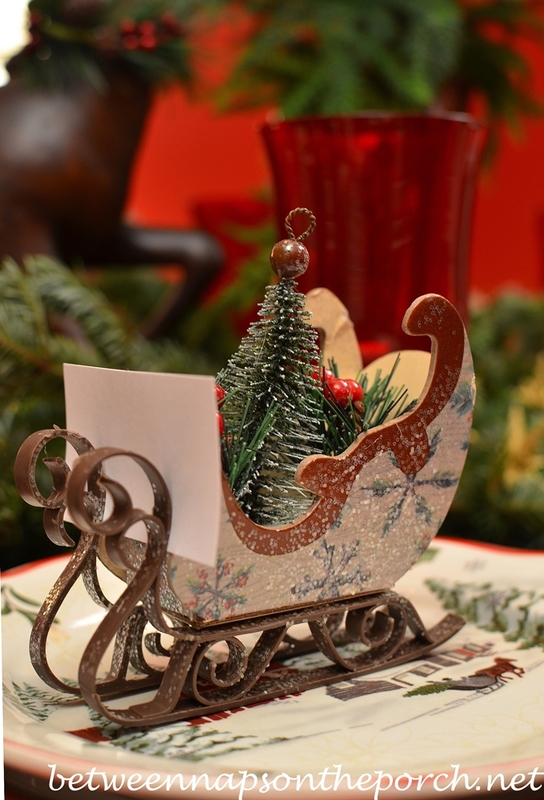 Love the sleigh/place card holder. Where did you get them? Would love to do that too. Thanks, Linda! I found those in the ornament section at Walmart this year. OMWord!! What a beautiful tablescape!!! I love it all!!! I love, love, love your sense of decorating! Simply gorgeous. I was wondering where you got your gold stars scattered on the table setting in the Dashing thru the Snow article? Thanks so much, Holly! Those were sent to me around 3 years ago from Colonial Candle. They are actually supposed to be little ornaments I think, because they had hanging strings/cords on them. I snipped off the cords to use them for this table. Wow, can’t believe I got a response so fast! Thank you so much. Off to hunt Colonial Candle. Merry Christmas! I have looked/called Wal Marts from Kansas to Dallas trying to find the BH&G dishes…found a pic of a set online, but no one has them. Are they somewhere else online? I even tried to find them on BH&G website, no luck. Kathleen, they sold out online at Walmart a week or two ago. I’m still getting comments and emails from readers who are finding them in some stores, but it’s total hit or miss now. The only thing I could suggest at this point is to look up their corporate number or call a store and ask to speak to a manager and get the corporate number from him, then call that number and asked them to look in their system and tell you which locations still show some left in their inventory. If you don’t find them this year, maybe they’ll bring them back again next year. They have been soooo popular, they would be foolish to not make them available again. What a wonderful setting! 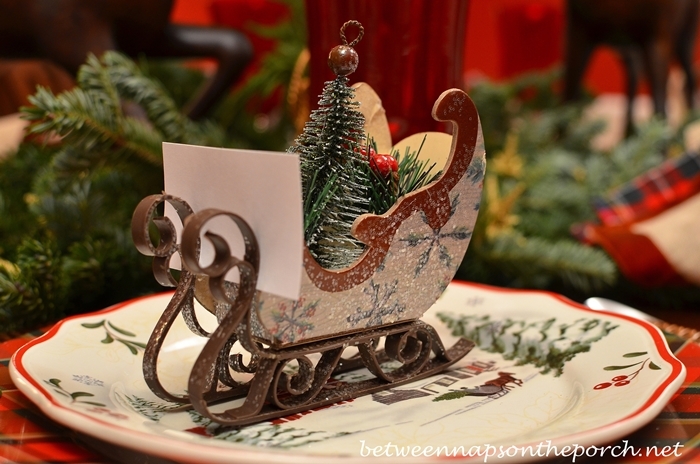 I especially love the sleighs as placecard holders! Have a wonderful holiday season! Thank you for Tablescape Thursdays, such a beautiful way of sharing. The one that now has the salad plates has all 4 designs )minus the red cardinal and bird. Here is my question…as I see a lot of your posts I notice you have 6 of the tree with the small rabbit on your green hutch (Which is darling), then in this post you have 6 of the Barn with the sleigh. Not to be nosey, but since I am a believer “you better get it while it is there” kind of person (you can always return, but once it is gone it is gone. Do you mind telling me just how many plates you do have of each salad plate pattern. Thank you!!! Glad they are finally turning up…have no idea why the Walmarts get them in the way they do…so random! I think I have 8 of each. The reason I try to buy 8 is because that’s how many my dining room table will seat when the leaf is in it. Of course, these plates easily mix together in a setting so a person could do with fewer of each pattern and just use them all together. These were inexpensive, I went ahead and bought 8 of each pattern. i just picked these up and noticed they don’t say dishwasher safe and R made in China. Have u washed yours through the dishwasher with no harm done? The owl plates that I just bought this winter but haven’t used all have stickers on the back that say Dishwasher and Microwave safe. When I used them for a Christmas dinner party last year, I think I washed them by hand, but the paper/removal sticker on the back of the ones I have do say they are dishwasher and microwave safe.